Born and raised in Philadelphia, music became an integral part of my life at an early age. Studying percussion and trumpet while also performing in my school orchestra, shaped and nurtured the love I have for music today, even though at the time competition swimming and bike riding were the activities that consumed much of my life. But as childhood gave way to adolescence during the early years of the 1960's, it was the sound of the guitar which completely captured my interest and fascination, and though not consciously aware of it, I intuitively felt a deep connection with the sound that emanated from this wooden box with its gentle curves and arched top, and the shimmering bell-like quality of the vibrating wire stretched along its neck. It felt to me as if I were awake in a dream, that in some very real sense I'd stumbled upon the meaning of my life itself, and my bicycle just never seemed to be off of its kickstand anymore. Music and the guitar consumed me so much that when I was asked not long ago during a Fanfare Magazine interview how closely intertwined are the guitar and composer inside of me, I answered that I can't make a distinction between the two. And now, thinking back to the time in my youth when I was happily struggling day by day to learn, and experiencing everything I played as joyful music no matter how it may have really sounded, I feel can make a similar comment. I don't think I could really make a distinction then or now between my "self" and my musical life. So with patience and determination along with the valuable music training I had as a youngster, plus mentally transcribing by ear everything I possibly could from so many kinds of music beaming through the airwaves, I taught myself to play. And within a few years I met up with other aspiring musical friends, and began playing weekend dates while still in high school. Possessing a naturally inquisitive personality, my desire to learn inevitably led me to pursue a more formal path of study, though I already had twelve years of playing experience behind me. I knew I needed to work within a disciplined environment to further develop my skills. From 1974 through 1976 I studied with south Philadelphia's well known jazz guitarist and composer Joseph Potosky, a true scholar and a wonderful and supportive teacher. Moving to Rhode Island in 1977, I continued my studies with classical guitar virtuoso Vincent Fraoli, protege to the Spanish master Rey de la Torre, one of the 20th century's great guitar composers. In 1979 after two great years in Providence, I lived for a year in Boston gleaning all that I could from the city's vibrant music scene, when an opportunity to teach on the music faculty of Norwich University in Northfield, Vermont presented itself. So I relocated to the Green Mountain State for what turned out to be a longer stay than I could have imagined. Though I'm happy to be back in Philadelphia, my years in Vermont were very enjoyable and rewarding. After settling in, I found myself drawn into Vermont's vibrant community of gifted musicians and artists. I was soon performing concerts, composing and arranging music, working as a studio guitarist, playing club dates, weddings and more (much of which I continue doing). The many opportunities to perform pushed me to keep learning and developing my technical skills. In addition to playing music, I also developed skills as a concert producer, promoting long term concert series and large events. Within Vermont's quiet (but surprisingly busy) recording scene, I have worked with Philo Records, Burlingtown Records, White Crow Audio, Otter Creek Productions, Straight Arrow Records, Rabbit Records, ERGO Communications, Cliff House Audio, Charles Eller Studios, and more. In my capacity as an instructor, I've taught at Norwich University, Johnson State College, The Monteverdi Music School, and The Vermont Summer Jazz Camp. I've led many workshops in schools and other venues, and have taught literally hundreds of students of all ages and levels, and other professionals looking to strengthen their own skills. Many of my young students keep up their serious musical study, with individuals graduating from New England Conservatory, Oberlin, The University of Miami, The New School (NYC), Weslyan, The Hartt School of Music, City College (CUNY), and many other fine schools. And many go on to become professional players and teachers themselves. I remain an active teacher, with private instruction in my home studio. his own finely honed material with his distinctive interpretation. During my career a great deal of my creative energy has also gone into growing as a composer. I am a member of Broadcast Music Inc. (BMI), the Vermont State ArtsCouncil, as well as the Vermont Composers Consortium (VCC), an inspiring group of artists which has grown to over nine hundred. The VCC membership also includes many more musicians from around the world showcasing music from every continent in a myriad of styles. 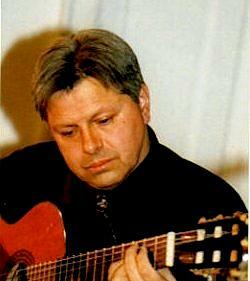 I compose and arrange for solo classical, jazz, and a variety of other guitar styles. 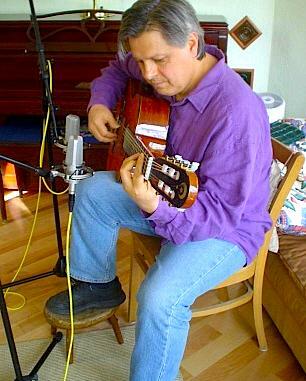 My most recent CD of original classical pieces for solo guitar, Between Silence, was released in October 2010. I also write for jazz ensembles of various sizes and instrumentation, my own world fusion ensemble Some Sort of Angel, and during the last years of the Soviet Union's existence, I was the musical co-writer and conductor for "The Heart Of the Mountain", a musical stage play which became the singing troupe of the same name. With this amazing group of kids from ages ten to fifteen, we performed concerts in the US and in Europe teaming up with young choirs from Russia to sing a message of compassion and peace during the demise of a cold war. I enjoy working with and teaching young people, but feel I am at my best as a teacher when working with highschool kids. Their energy, enthusiasm, and willingness to do the work is rewarding for me as I watch them grow and learn. I also write music for documentary film, a creative field I enjoy very much. It feels natural for me because I often watch good films in any genre repeatedly, just to hear the music and observe how it enhances the visual aspects of the film enabling the audience to more deeply connect with the story. It is an intense kind of work especially working within the parameters of deadlines, and in this sense is no different than my years spent in the atmosphere of music studios. The need to remain totally open, focused, and innovative on cue for long periods, can be very exhausting. But nevertheless, it is really fun sculpting a sonic environment which compliments the feeling and movement of the story without overwhelming it. Many of the musical pieces could actually stand alone as complete compositions. But their purpose first and foremost is their integration into the fabric of the film. Projects I've worked on have been invited to screenings and received awards at film festivals like the Vermont International Film Festival, The Newburyport Documentary Film Festival, and The Green Mountain Film Festival, and have been featured on PBS. to world music and jazz as well. I can't imagine anyone not enjoying this CD. A few favorite projects would have to include "GIE: Governor's Institute on Education", which focused on just one of the several two week intensive summer sessions for highschool students who are creatively exploring an area of interest that may lead them into a career. This session focused on teaching and was underwritten by The Governor's Institutes of Vermont; "THE RED WAGON: Facing Hunger in Vermont" underwritten by The National Food Bank of Chicago and The Vermont Food Bank explores in depth the issue of food insecurity here in Vermont; "JUMP", a film about the students attending the two week intensive at The Governor's Institute on the Arts and Sciences set at Castleton State College; and "ON THE EDGE: Holes in the Vermont Health Care Safety Net", a short film about the health care insurance crisis in Vermont. One incredible project I contributed to was an amazing film made by the Tzu Chi Foundation, the world wide five million member Buddhist organization founded and based in Taipei, Taiwan. It is a film that was shot in real time on location as the Trade Centers fell in New York. But beyond the drama of those sad and frightening moments, the true essence of the film focuses on the deeply loving and selfless work the people of this organization do in helping millions of us everyday and everywhere no matter what kind of a crisis we may find ourselves faced with. I feel hope and a strong will to create knowing that there are literally millions of people working together everyday through love to make life better for all of us around our planet, even if we can't always see them. And I was deeply honored when producer Hoping Chen titled the film "Some Sort of Angel." My music has been featured many times on nationwide commercial and public radio stations, on national television, on hundreds of alternative and college stations around the country, and on many concert stages. American and European jazz, classical, Central Asian, Brazilian, Spanish, and American folk sounds are my strongest musical influences, lending a pancultural feeling to my music. But the sounds and lives of people in lands I have yet to visit, are nevertheless deeply felt and heard inside of me, and have become inseparable from who I am today as an artist. I enjoy reading and studying on culture, history, art, religions and customs, even geography and astronomy, and anything which will help me grow as an artist and personally. I also travel when I can, which creates the most vivid opportunities to learn about the world and about one's self. for anyone desiring to hear something real." 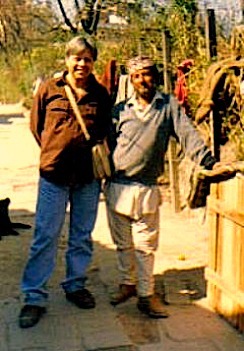 I feel a strong connection with India and Nepal having lived in Calcutta for six months absorbing the music and the Bengali culture, and spent time in Kathmandu where I was deeply touched by the Nepali culture and the wonderfully gifted people of this incredible country. The city of Calcutta with its fourteen million souls is an enigma even as it is the cultural heartbeat of India as well as Central Asia, and one of the great art cities of the world. I learned from some of the greatest musicians and people I've ever had the opportunity to know, while taking in the richness of this astonishing place. But Calcutta exists within a severe paradox as it also bears the misfortune of so much pain, poverty, and an overwhelming sadness. It is in a very real sense the world we inhabit figuratively and literally: a brilliant light beaming life, creativity, and hope from it's strong beating heart, sharing the same body with darkness, homelessness and hopelessness, the latter being a place few of us would rush to explore. It was a sharp catalyst that pulled me into seeing what I couldn't. It has taken time to gain an understanding of what occured inside and outside of me while I was there and since I've returned. I can feel how my experience and perception of time have been deeply altered, in some way transforming the idea of meaning itself. Being real, living a creative life, and practicing kindness are all that have meaning for me. And from this awareness comes one's truth. I feel deeply that it's the only way to make good music, and personally speaking, the only path to a good life—a life well lived.